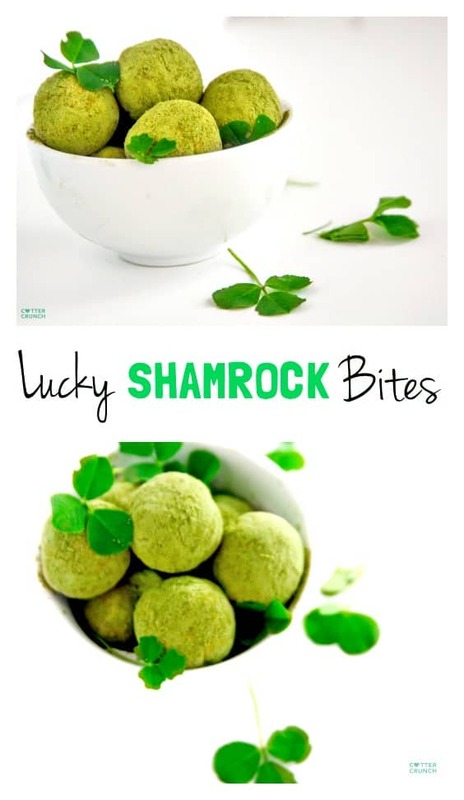 Shamrock shake protein bites are a fun and healthy St. Patrick’s Day treat! 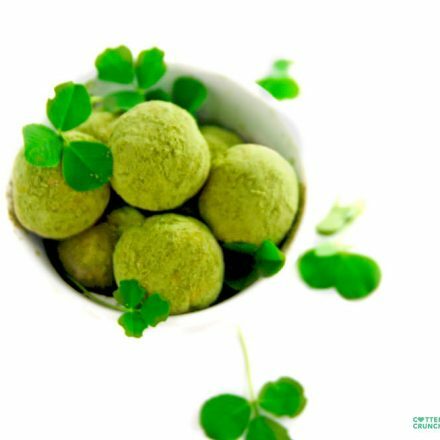 Snack healthy with this Vanilla Matcha Shamrock Shake protein bites recipe. They’re packed with antioxidants, good fats, and protein. 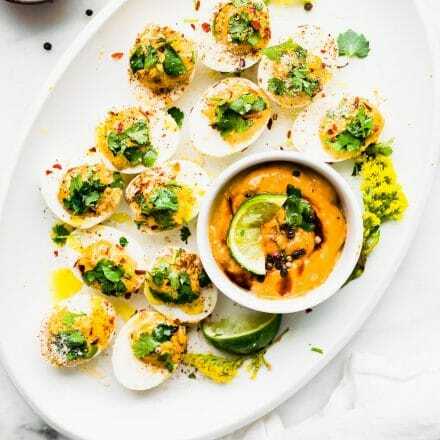 Oh, and they’re a gluten-free, grain free and paleo-friendly recipe, too! Well hello March! You sure did sneak up on me and so did St. Patrick’s day. Luckily (no pun intended), I was prepared. 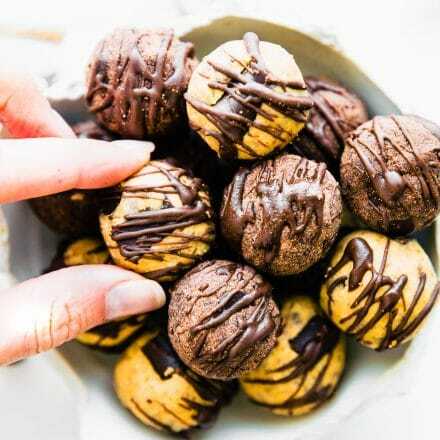 You see, before I left for New Zealand, I made these no bake protein bites. I also devoured them all by myself, no shame here folks. But what I didn’t realize is how much I needed the green ingredient in these bites to help with time change/jet lag. Yup –> Matcha! It’s everywhere. It’s the new trend, as it should be. This little gem of an antioxidant does wonders. Let’s chat about matcha, shall we? Matcha Green Tea is steamed, stemmed, and de-vined before being grounding into a soft fine GREEN powder. How does it stay green? –> The powder is stored away from light ( and oxygen) which helps preserve it’s antioxidant properties and colors. But why the hype? Well, this super food has loads of antioxidants as well as an amino acid called L- THEANINE . L-Theanine can help with the production of dopamine and serotonin and therefore help balance sleep/wake cycles, naturally. Oh and these two chemicals can also improve mood and concentration. YES, I NEED THAT! 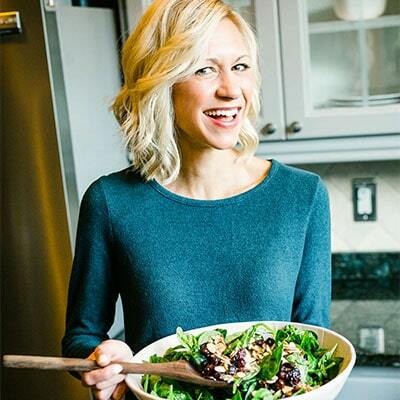 Now do you see why I made this grain free shamrock shake protein bites recipe? First, grind up your banana chips. Then just mix up dry ingredients and add in nut butter, extract, and honey. Mix well, then roll into balls/bites. Freeze right away then use extra green matcha Powder and a little bit of vanilla protein or coconut flour to coat. Store in fridge or freezer to maintain freshness. Makes around 30 -25 bites, give or take. NOTE –> if your batter is dry, you might need to add more honey and/or nut butter to keep batter from being to dry. Feel free to sub the ground banana chips for ground nuts, almonds, oats, flour, etc. Have you ever had a shamrock shake? Ever tried matcha? Some amazing recipes have been made with matcha, like these white chocolate matcha cookies and this white chocolate matcha cookies! Cheers and don’t forget to wear your green next week! My favorite green food would be brussel sprouts. I also like parsley alot! 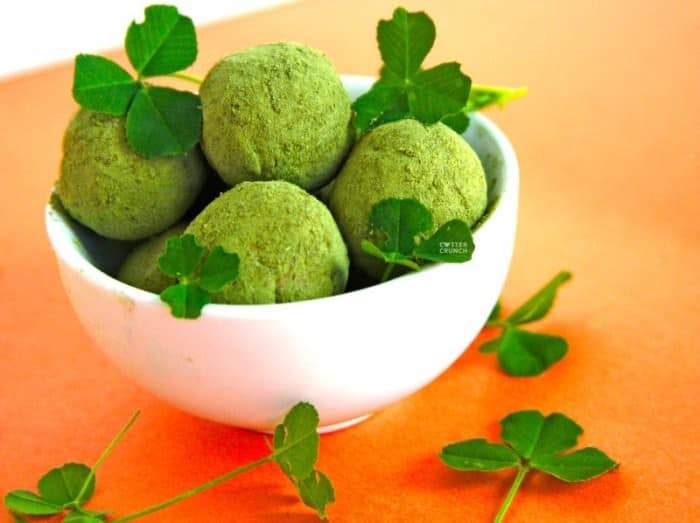 !I’ve never tried Matcha before but these bites look so lucky and delicious I just might have to run right out and get some!!!!!!!!!!!!!! avocado is my favorite green food for sure! Ive actually never tried matcha or a shamrock shake!! I totally agree! Matcha really is powerful and amazing! THESE LOOK AWESOME! Can you believe I’ve never had a shamrock shake? But if they taste like the way these seems like they’d taste, I’m sure they’re awesome!! Thanks for sharing the recipe!! These are beyond festive, I love them! My fav green food…I don’t know if I can choose. Big fan of spinach and any fresh herb. Oh yum! I want to try these for sure! St. Patrick’s Day is such a fun holiday–so many variations of green foods we can play with! These look great! I started using matcha after doing a review a few months ago. I might need to give these a try this weekend! My favorite green food is probably spinach, I know that sounds lame though… pistachios are awesome too! Love the healthy shamrock shake in bite form- yum! yes, matcha is everywhere….and I am not sure how I feel about it yet as I messed it up the first time and it put me off! I need to give it another try! Love that you are just such a genius with these healthy bites. Love them! I love the use of the banana chips in these so creative. And they are so green. I haven’t tried matcha yet but this would be a great way to! love it! 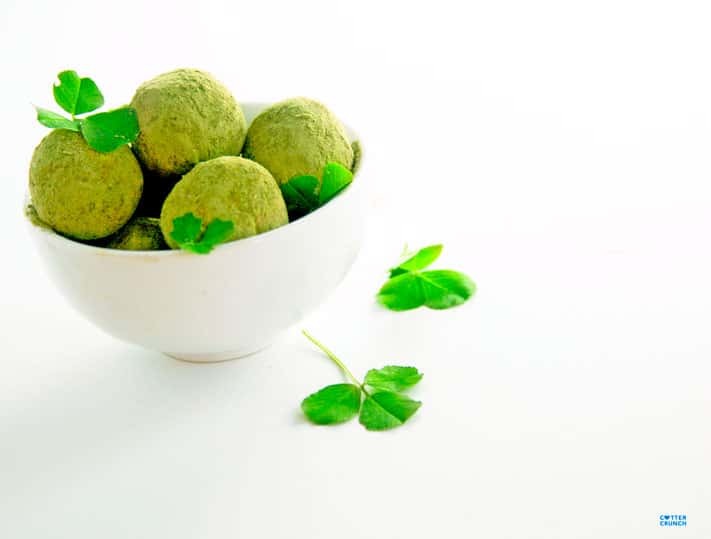 I love love love matcha lattes <3 These bites look amazing! Didn't know about all the super powers of matcha and now I love it even more. Green foods? I have so many favorites. Lately I've been loving zoodles, brussels sprouts, kale, arugula, spinach…. the list goes on. I love spinach and asparagus! But I’m probably a bigger green tea fan. I will always and forever love green smoothies–in fact I’ve been adding a tsp of matcha to mine lately and it’s fantastic! I love green smoothies! I have them almost daily! these are such a fun color! I love green leafy goodness! These look amazing! I used to drink matcha latte’s and protein shakes when I worked at Starbucks and they were my favorite! Never would have though to put them in a healthy bite! Such an interesting recipe. Oh, and favorite green food is probably swiss chard or spinach! I have matcha powder just itching to be used 🙂 Favorite green food is a toss up between broccoli and avocados! So hard to pick!! Spinach or kale or sugar snap peas or asparagus..
My favorite green food would probably have to be green smoothies! Thanks Lindsay! Ok, it feels good to be more on the front end of a health trend, than the hind. HAHA. Luckily, I read more amazing health and fitness blogs like this, so I can be WITH the times, instead of behind. What thrills me most about these balls is the color and texture….they practically look mossy, in the best way. LOVE LOVE, and am excited to try! I keep meaning to buy coconut flour! Thanks for reminding me. I’m not sure I have ever had a true shamrock shake but I do love matcha! These Healthy Bites sound delicious. My fav green food is probably kale, especially made into kale chips with lots of nutritional yeast on top! This is perfect. I actually thought about emailing you yesterday to ask if you had a preferred brand of matcha. I found one on Amazon that is best seller for culinary uses. So…I wasn’t sure. I think my favorite green food may be asparagus, or peas, or kale, or …. I like most green foods! My favorite green food is broccoli or spinach. I like using spinach greens instead of iceberg for a salad. Zucchini is also good. I like fresh veggies. Lindsay -LURVE the natural color on these little bites! You know what – I haven’t yet tried matcha green tea to cook/bake with, it might be my favorite green food once I do. Currently though I adore spinach! Whether it be savory or sweet, spinach is my go to for natural green coloring! My fave green food is green grapes! Matcha balls!!! I need to make these. Stat. I love pistachios 🙂 and I can always eat green peppers! My favorite green food is broccoli, but it may become these protein bites!! Those awful McDonalds St. Patricks shakes…just kidding…well sort of and green peppers! those balls are so puuuurty. I need to try matcha powder! These look amazing!!! I can’t wait to try them! I wish mine would have turned out that green. The most recent organic matcha I got wasn’t very bright and I was bummed I had used the last of what I had previously in the balls vs coating them. Plus it bummed me out for my other recipes but hey they still get the health benefits of mactha! These are genius! Loving that vibrant green color …and I’m quickly realizing I need to get some matcha! 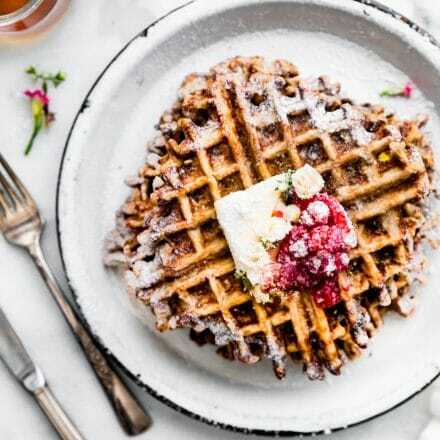 These looks delicious! Thanks for the recipe, Lindsay. hmmm favorite green food…either green smoothies or roasted broccoli! I need some relaxation in my life!! My fave green food? Brussel sprouts! Green foods are my favorite. From asparagus to broccoli to kale to romaine lettuce to avocados, I love them all! 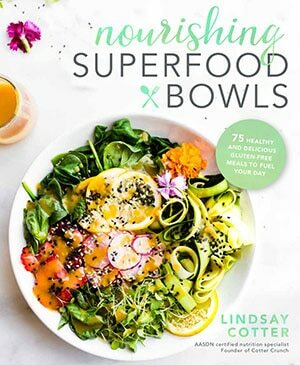 These healthy bites sound awesome, especially since I’ve been on a big matcha kick lately. My favorite green food? Artichokes! Green is my favorite color! 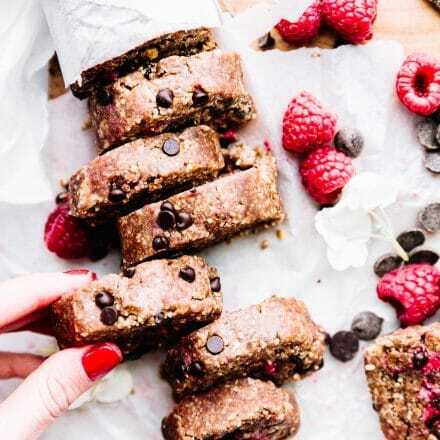 Love the look of these healthy bites and the ingredients sound yummy! Favorite green food? Avocado! My favorite green foods are avocado and spinach. My favorite green foods are spinach, broccoli, and swiss chard. Totally intrigued by this recipe. Love that green color! oh my goodness! these are so darn cute! I love shamrock shakes from mcdonalds but unfortunately i haven’t had one in ages!!! haha you’re not missing out on Mcdonalds. I’ve been obsessed with matcha as well! What a great idea to roll the bites in it! Good idea, I have some matcha powder in the cupboard just waiting for a project like this. Healthy would be green beans. I eat them raw every day with lunch. Not healthy would be any pistachio or mint ice cream. I love green vegetables – spinach and broccoli are my favorites! I was thinking of making some sort protein bar for St. Patrick’s day. All I could think about was adding spinach or some vegetable though! I am so glad I came across this – matcha is a much better alternative. My favorite green food is definitely avocado. I eat it every day! But grilled asparagus would be a close second.